Steve Jobs revealed the Apple iPad today, its much-awaited tablet computer. Jobs positions it as a third computing device between a laptop and a smartphone geared towards the “key tasks” of Web browsing, email, sharing photos, watching videos, playing games, and reading digital books. All current iPhone apps will run on the device, as well as new games and digital books designed specifically for it. An enhanced iPhone SDK released today will support both the iPhone and the iPad. Some specs: The device has a 9.7 inch display, weighs 1.5 pounds, and is half-an-inch thick. It is powered by new chip made by Apple itself, a 1 GHz A4 and will come with 16Gb to 64 GB of storage. It supports WiFi, has an accelerometer, compass, and built-in speaker and microphone, just like the iPhone. The screen is a full capacitive multi-touch screen. Battery life is supposed to be 10 hours. In addition to WiFi, it will have a 3G option from AT&T. The Wifi-only version, with 16GB of memory, will cost $499. A 32GB version will be $599, 64 GB will be $699, and with 3G from AT&T it will cost $829 (for the 64GB version). All the 3G iPads, however, will be unlocked, meaning they can be used on other carriers as well. 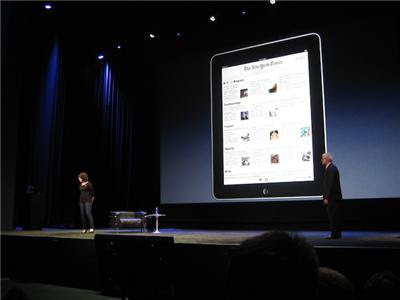 On-stage, Apple highlighted the iPad’s use as a digital reader. The iPad comes with a new app called iBooks.